The development application proposes to subdivide a large rural property into two lots. One of the proposed lots (Lot 21) does not have frontage to a Council public road, but has frontage to Hanging Rock Road, which provides the only means of vehicular access to the land and the proposed building envelope. Hanging Rock Road is a single lane width unsealed gravel Crown road, not currently under the control of Council. If the application is approved, then Hanging Rock Road will be transferred to Council in accordance with the Department of Land and Property Management Authority protocols for road transfer. Should Council not approve the application, then the road will remain a Crown road. The issue of Crown roads has attracted much attention recently and Council will now have a better appreciation that the transfer of Crown roads is an added burden in terms of the maintenance of road assets and raises significant financial issues for Council. Council needs to carefully consider each application on its merits and weigh up whether the approval of a subdivision with access from a Crown road is in the public interest. In this instance it is considered that the costs to Council of approving the creation of one (1) additional lot with a dwelling entitlement in an isolated rural area, is not justified. In addition to the concerns regarding access, the development of the land is also constrained by steep slope and thick remnant vegetation which limits the future erection of a dwelling to a small elevated plateau directly beside Hanging Rock Road. This raises additional concerns relating to the suitability of the site for the erection of a rural dwelling, given the potential bushfire impacts and dust nuisance from traffic, including logging trucks on Hanging Rock Road. For these combined reasons the application is recommended for refusal. As an alternative to the recommendation, Council has the option of approving the development application. It is noted that the subdivision proposal is permitted with Council consent and satisfies the minimum lot size requirements. However, the bushfire Safety Authority certificate from the RFS comes with a number of conditions and a general advice which starts with "The RFS raises concerns with the identified building footprint within the proposed Lot 21"… Draft conditions of consent are attached to this report for Council’s information should it be of the mind to approve the application, noting that a draft condition has been included requiring the applicant to upgrade part of Hanging Rock Road to the standard of a public road. The land proposed to be subdivided originally formed part of a larger farm on multiple titles which was consolidated and re-subdivided with approval being granted under delegated authority in 2007 (reference DA 2007/016). 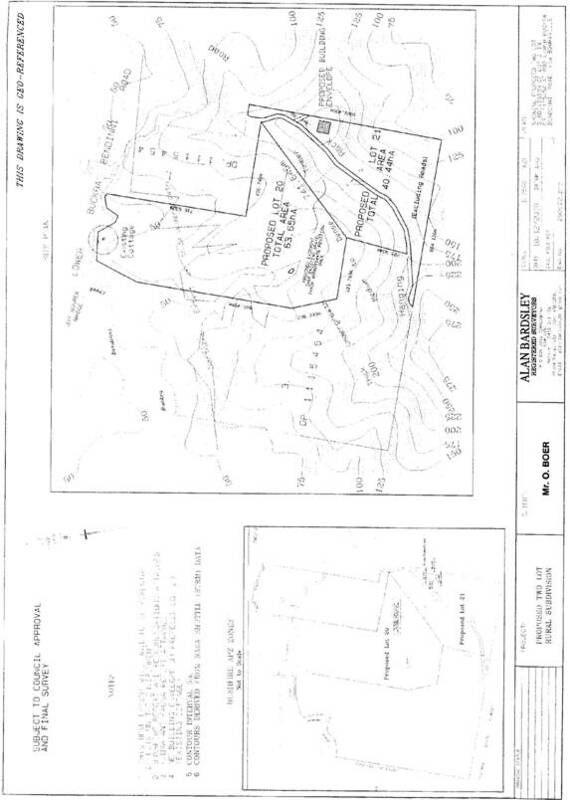 As part of the original application the then land owners (Mr Okko Boer, Mr Werry and Mr Seahouse) sought to subdivide the land into five (5) lots, however Council staff advised that they would not support two of the lots because of concerns regarding access being required off Hanging Rock Road. Subsequently, the application was amended by deleting two of the lots, so that no new lots required access off Hanging Rock Road. The current application is proposing an identical layout to the one which did not have the support of Council when it was previously submitted. The position of the Planning Department remains consistent with previous advice that no new lots should be created with access from Hanging Rock Road. It is proposed that the existing property which includes an old rural dwelling house, be subdivided into two (2) large rural lots. One of the lots (Lot 21) will be accessed from Hanging Rock Road which is a single lane width unsealed gravel Crown road. Because of the steep slope, remnant vegetation and access issues, the building envelope is restricted to a small elevated plateau directly beside Hanging Rock Road. At present the main traffic on Hanging Rock road is limited to logging trucks accessing the adjoining state forest and sightseers accessing the lookout. It does not appear that any existing rural dwellings rely on Hanging Rock Road as their primary means of access. The issue of subdivisions being accessed by Crown roads has attracted much attention recently with two separate rural-residential subdivisions being proposed off a Crown road (Smiths Lane) near Bowraville. Council needs to carefully consider each application on its merits to ensure that the subdivision does not result in an unsustainable financial burden on Council. In most instances, where subdivisions are proposed off Crown roads, Council will take the opportunity to initiate a “user pays principle” and require the developer to construct the road and dedicate it to Council as public road, so that the costs are not borne by general ratepayers. A Section 94 contribution also applies for rural subdivisions and in this instance, a contribution of $4,821 would be levied for future road maintenance. While this approach is workable where a number of lots are proposed off a small section of crown road, it is not practical in an isolated rural setting where one additional lot is proposed off a long section of crown road. In this case, it would be cost prohibitive to require the developer to construct the crown road to public road standard and alternatively it would be an unjustifiable financial burden for Council to either construct or maintain the road for one additional rural lot. “The RFS raises concerns with the identified building footprint within proposed Lot 21. The asset protection zones (APZ) required will be located on lands that are greater than 18 degrees. Issues relating to the extent of land clearing, the difficulties of on-going maintenance of the required APZ's, the risk of land de-stabilisation on these slopes where land clearing has taken place and the possibility of vegetation located upon steep slopes supporting a crown fire. In this regard the council should ensure management requirements do not conflict with the management of APZ’s required by the NSW Rural Fire Service”. The dust concerns are a direct result of the close proximity of the building envelope to the unsealed road and the fact that the building envelope cannot be easily relocated to another part of the land. Council’s DCP(4) Subdivision requires bitumen sealing for a 100m distance, unless the dwelling can be sited 300m from the road. If Council were to require bitumen sealing, it is arguable that the roadworks would be largely ineffective given the close proximity of the dwelling and the use of the road for logging trucks. In summary it is considered that a combination of all these issues indicates that the site is not suitable for the proposed development and the development would create an unreasonable and uneconomic demand for the provision of services and the application should therefore be refused. Council’s Director of Engineering Services has reviewed the application and noted that transfer of Hanging Rock Road to Council would be a significant cost burden that is not justified and not compensated by the developer contribution charges levied for rural road maintenance. Department of Land and Property Management Authority were referred a copy of the application and advised that approval of the subdivision would initiate their road transfer protocols and the road would be gazetted to Council. The application was referred NSW Rural Fire Service on two separate occasions. In the first instance the RFS were not prepared to issue a bushfire safety authority under section 100B of the Rural Fires Act, because of concerns relating to slope and vegetation and the ability to provide asset protection zones around the building envelope. Eventually the RFS were prepared to issue approval with the general advice referred to above. The RFS advice is not common practice and raises some concerns for Council whether the land constraints will accommodate the measures required to comply with “Planning for Bushfire Protection Guidelines 2006”. None specifically applicable to the development. · The building envelope on proposed Lot 21 does not maintain a sufficient setback to Hanging Rock Road to address the potential for dust nuisance. It is considered that bitumen sealing of the road would be largely ineffective. · The building envelope does not maintain a sufficient setback to side boundaries to adequately address the provision of asset protection zones, to minimise bushfire threat and the building envelope cannot be easily relocated because of the steep slope of the land. · Proposed Lot 21 does not have direct frontage to a public road, but depends on access over a Crown road. Hanging Rock Road will be transferred to Council in the event that the application is approved and Council will be expected to upgrade and maintain the standard of the road, to service one additional lot in an isolated rural area. If the development were approved, then Hanging Rock Road would be transferred to Council in accordance with the Department of Land and Property Management Authority protocols. This would create an unreasonable and uneconomic demand for council to maintain a large section of rural road that is used predominantly by logging trucks. The future erection of a dwelling in the nominated building envelope would require substantial vegetation clearing which would be impractical and undesirable from an environmental perspective and it is questionable whether the development would satisfy the Planning for Bushfire Protection Guidelines 2006. Furthermore the close proximity of the building envelope would be adversely impacted by dust nuisance irrespective of whether the road is bitumen sealed. The development of the land is dependent on demonstrating that the physical constraints are appropriate or can be overcome by proper site analysis and appropriate design responses. The application has not resolved either of these issues to the satisfaction of the Planning Department, and it is considered that the physical constraints on the site that would make the land unsuitable for the development as proposed. Council received no submissions during the exhibition of the development application. Approval of the development would not satisfy the public interest because it will add an additional burden to Council’s road assets and create an unreasonable and uneconomic demand for services, not justified by one additional lot in an isolated rural area. The development will create one additional lot with a dwelling entitlement and therefore increase the supply of land and rate base. However, the potential costs to Council and the general public does not justify approval of the application. Approval of the application would have significant financial consequences to Council which have been detailed in previous sections of this report. There is an opportunity for the applicant to challenge Council’s decision, in the event that the application is refused. If this eventuated, the Planning Department is confident that it could successfully defend a decision of refusal. Hanging Rock Road fronting the building envelope for proposed Lot 21 is to be constructed as a 6m wide bitumen seal with a minimum 8m wide formation within a minimum 20m wide road reserve. The road works and any associated drainage works, must be in accordance with Council’s Aus-Spec #1 Design and Construction Specifications. The table drains are to be turfed for their full width. Water, electricity and gas and property access, are to comply with section 4.1.3 & 4.1.3.2 of ‘Planning for Bushfire Protection 2006’. Sealed driveways, in accordance with Council’s rural driveway standards, from the edge of the bitumen seal to 3 metres within the property boundary of each of the proposed new allotments. Consent from Council must be obtained for all works within the road reserve pursuant to Section 138 of the Roads Act 1993. Three (3) copies of engineering construction plans must accompany the application for consent for works within the road reserve. Such plans are to be in accordance with Council’s Engineering Standard. An application for a Subdivision Certificate must be made on the approved form. The Subdivision Certificate fees, in accordance with Council’s adopted schedule of fees and charges, must accompany such application. Six (6) copies of the plan of subdivision are to be submitted with the application for a subdivision certificate. The location of all buildings and/or other permanent improvements including fences and internal access driveways/roads must be indicated on 1 of the copies. A restriction on the use of land shall be created to limit the erection of a dwelling on proposed Lot 21 to the indicative dwelling envelope unless a detailed site assessment is undertaken prior to development approval. In this regard, the indicative dwelling envelope is to be shown on the final plan of subdivision. As an alternative to reticulated electricity supply, Council may accept on-site electricity generation provided a restriction on title advises prospective purchasers that reticulated electricity supply is not connected to the proposed lots and any extension of electricity will be the responsibility and cost of the landowner seeking to extend electricity supply. The creation of any necessary easements for electricity purposes as required by the electricity supply authority. Any further development application for class 1, 2 & 3 buildings as identified by the Building Code of Australia (BCA) must be subject to separate applications under section 79 BA of the EP & A Act and address the requirements of Planning for Bush Fire Protection 2006.
ope unless a detailed site assessment is undertaken prior to development approval. In this regard, the indicative dwelling envelope is to be shown on the final plan of subdivision. At the issue of subdivision certificate and in perpetuity, the land around the existing dwelling on proposed Lot 2 to a distance of 20 metres shall be maintained as an inner protection area (IPA) as outlined within section 4.1.3 and Appendix 5 of Planning for Bushfire Protection 2006 and the NSW Rural Fire Services document “Standards for asset protection zones”. As an alternative to reticulated electricity supply, Council may accept on-site electricity generation provided that a restriction is placed on title advising that reticulated electricity supply is not connected to the proposed lots and any extension of electricity will be the responsibility and cost of the landowner seeking to extend electricity supply. The Protection of the Environment Operations (Clean Air) Regulation 2002 applies to the entire Nambucca Shire Council Local Government Area. Changes to the Protection of the Environment Operations (Control Of Burning) Regulation 2000 legislation in 2006 have resulted in Guidelines for burning in the Nambucca Shire which are attached becoming out of date. It is noted that the Protection of the Environment (Clean Air) Regulation 2002 is being revised and a new regulation is due for release in 2010 which will prompt the need for a further update of the Policy to keep abreast with legislation changes. That the Control of Burning Policy be adopted until revised legislation is released by the Department of Environment, Climate Change and Water in 2010. 1 Adopt the Control of Burning Policy under the Protection of the Environment (Clean Air) Regulation 2002. 2 Adopt the Control of Burning Policy under the Protection of the Environment (Clean Air) Regulation 2002 as an interim policy until 2010 when the new legislation is released. The Protection of the Environment (Clean Air) Regulation 2002 is designed to prevent air pollution from air borne particulates and chemicals and eliminate localised nuisance caused by smoke and odour generated by inefficient backyard burning off. There have been an increasing number of enquiries relating to burning by residents of the Nambucca Shire. The majority have been relating to smoke production, odour and human health effects. Fire can be a useful tool for reducing bush fire hazards, removing rubbish and carrying out agricultural activities. Inappropriate use however, can endanger lives, property and the environment. Each year fires have damaging impacts on people’s lives, property and the environment. This Policy sets out ways individuals can help avoid damaging impacts by following some basic procedures and knowing how to obtain the correct approvals, prior to burning. The purpose of this Policy is to clearly define the responsibilities of organisations regarding the issuing of fire permits and approvals in all areas of the Shire. General, local and specific obligations are set out clearly in the Policy, including the exceptions and exemptions. Health issues are discussed and penalties noted. The Policy summarises the types of approvals required in Nambucca Shire Council area for different burning activities and where to obtain that permit. The process for burning in the shire is set out clearly for both the current Protection of the Environment (Clean Air) Regulation 2002, and for the revised 2010 legislation where the Council, in a previous Council meeting, voted to have the Shire listed in both Part 2 and 3 of the new legislation. There was one submission with comments for the Draft Control of Burning Policy, this has been assessed and a response provided in the following table. To clearly set out the obligations of landowners and residents in respect to burning off in the Nambucca Shire Local Government Area and to compliment Council’s ongoing commitment to a comprehensive and long-term plan for air quality management across the Shire. To clearly set out the obligations of landowners and residents in respect to burning off in the Nambucca Shire Local Government Area and to compliment Council’s ongoing commitment to air quality management across the Shire. The majority of enquiries have related to concerns regarding smoke production, odour and human health effects. Question the need for the first statement as this policy applies to all residents and it suggests we think it is ok to use fire for hazard reduction etc. Could be a liability issue. Also the reference to fire being a useful tool to remove rubbish?? Assume this means weeds however it is unclear and could be interpreted as domestic waste. Suggest simply: Inappropriately lit or managed fires can endanger and damage lives, property and the environment. 2nd sentence of this para should come first ie The purpose of this Policy is to clearly define the responsibilities of organisations regarding the issuing of fire permits and approvals throughout the Shire. This Policy sets out the process and considerations for obtaining the correct approvals, prior to burning. Have removed reference to ways individuals can avoid damaging impacts by following basic procedures because it implies information relating to burning procedures, which this policy does not contain. This section should start with a reference to the need for any persons planning to undertake burning being aware of their obligations under Part 6C General obligation to prevent or minimise air pollution of the Regulation. The requirements of this section of the Reg have been used as basis for the second point in 5.2 but I think it should be up front in this section. Also our draft omits one point from the reg ie iii) the length of time that the material being burnt is likely to burn. This should be included. · treated timber – copper chromium arsenate (CCA) & pentachlorophenol (PCP); except where exempted in accordance with Clause 6D of the Regulations. Nambucca Shire Council is committed to sound management and control of backyard burning especially in closely settled areas. I believe Council should discuss whether it still supports this part of the policy given the environmental impacts and ability to recycle via transfer station. To continue without considering review of this aspect especially given our regional waste agreement is in conflict with the statement in 5.3. We should discuss possible options eg whether we should require a permit to burn domestic waste in non serviced areas which would then enable a higher degree of awareness regarding materials which should not be burnt etc. This section is the nuts and bolts of the doc and needs to be more clearly laid out. First para – did we/can we ‘adopt’ part of a Reg? The way this is written really gives the reader no idea what the implications of us adopting Schedule 8 Part 2 of the Regulation that deals with burning of vegetation. Nambucca Shire is listed under Schedule 8 Part 2 of the Regulation as an area in which burning of vegetation is prohibited except with approval. Second para is long winded. We will have to review the wording re zonings once the new LEP is adopted. Also the sentence ‘Burning of vegetation (subject to the general obligations) is permitted other than within the urban and rural residential areas.’ Suggests it is ok in commercial and industrial areas? I am not sure that that is the intention. See below for suggested sentence to clarify this. Controls on burning vegetation apply within towns and villages and urban and rural residential zonings. Council has delegated to the Rural Fire Service (RFS) authority to issue approvals to burn domestic waste and vegetation, where a domestic garbage service is NOT provided. Burning of vegetation (subject to the general obligations listed in 5.2) is permitted in rural zones only and excluding rural residential areas. Any persons wishing to burn vegetation in an area identified in bold yellow on the maps, that form part of this policy, must submit a written application to Council. This policy constitutes an approval to burn under Clause 6G(2)(a) of the Regulation. The note is also hard to understand – what does ‘class of persons’ mean? Why a double negative with ‘Council is not precluded’ rather than saying ‘Council will consider individual cases…. etc? Also am assuming the controlled area is the bold yellow on maps? This should be clarified. Am not going to try to suggest wording as am unsure as to meaning of note. NOTE: Council is not precluded from considering individual cases involving a class of persons for burning of dry vegetation on their merits within the controlled area. Council officers are required under the Regulation to assess each application presented against a number of heads of consideration and issue a written approval if satisfied with it. Council must keep a copy of each approval and maintain a public register (see Section 5.8 of this Policy). The last sentence regarding notification requires deserves higher profile. Should be a stand alone clause or in bold type. Are we able to issue penalties for beaches of our policy also or does a breach of our policy automatically constitute a breach of the Act? If a permit is suspended or cancelled on days of ‘High Fire Danger’ to ‘Extreme Fire Danger’ or when DECC declares a ‘No Burn Day’ we should set out in this clause the process ie is the permit holder contacted re the change of status of their permit or they responsible for confirming that their permit is still valid ie that it is not a day of high to extreme fire danger’ or DECC declared a ‘No Burn Day’? A Bushfire Hazard Reduction Certificate (BHR Certificate) is the environmental approval for hazard reduction work only. work only. This section is a bit messy. I thought we were required to advertise all applications? ‘….deemed plausible’ is too vague. If not then Council should determine its position re this. If it is not a standard requirement then this policy should spell out the criteria used to determine whether an application will be advertised or not. Why does Council cover the cost of the advertising? Perhaps it should be at least a shared cost. Submission of an application to burn off is to be directed to Council after careful consideration of the table in Section 5.8 of this Policy. If the application does not fit the criteria it will be rejected and there is no need to advertise. Those that fit the criteria are advertised. 2 In Residential Areas including Rural Residential Areas and areas shaded yellow on the maps in Section 4 of this Policy, an approval from Council is required all year prior to burning. In addition, a permit from the Rural Fire Service (RFS) or NSW Fire Brigade (NSWFB) is required during the Bushfire Danger Period prior to burning. The RFS and NSWFB will not issue a permit until Council has granted an approval. 3 In Non-residential Areas and areas outside those shaded yellow on the maps in Section 4 of this Policy, an approval from Council is not required prior to burning. However a permit from the RFS/NSWFB is required during the Bushfire Danger Period prior to burning. 1 Why the vegetation cannot be disposed of in an alternative manner eg. Chipped/mulched, composted, placed in Green Bin, taken to the tip or taken away by a contractor. 2 Proximity of neighbour’s house. 3 Other amenities in the immediate area eg schools, playgrounds, nursing homes and commercial district, hospital. A ‘Burning in Nambucca Shire’ application form must be completed and fee paid at the time of lodgement. Once the application is received by Council it will be assessed and (if necessary, possible – other appropriate wording) a Public Notice will be placed in the local print media calling for submissions in relation to the proposed burn within 7 days (refer to example below). The cost of the public notice is included in the application fees. The cost is included in the application fee. Is referred to in the policy as the “Burning in Nambucca Shire application form” but the form itself doesn’t have a title. This could cause confusion as to whether it is the right form. Immediate air quality will improve in problem areas and overall will reduce air borne particulate matter for the whole region. The community’s air quality will be improved and a better quality of life will be had by many members of urban and rural residential areas. Those living with asthma will greatly benefit. The potential risk is low. There are no financial impacts on current or future budgets. Fire can be a useful tool for reducing bush fire hazards, removing rubbish and carrying out agricultural activities. Inappropriate use of fire however, can endanger lives, property and the environment. Every year a substantial number of fires have damaging impacts on peoples’ lives and the environment. Individuals can help avoid this by following some basic procedures and obtaining the correct approvals (NSW Rural Fire Service, 2003). There are two types of burning approvals that may be required, a permit to burn safely and/or an environmental approval. A person that lights a fire without the required approvals is guilty of an offence with a maximum penalty of $110,000 and/or imprisonment for 14 years. Further penalties may be incurred if environmental regulatory legislation was breached or where a fire causes substantial damage, injury or death (NSW Rural Fire Service, 2003). In recent times, large numbers of enquires relating to burning have been made by residents of the Nambucca Shire. The majority of these relate to smoke production, odour and human health effects. In May 2003 a meeting was held between representatives from Nambucca Shire Council, the NSW Rural Fire Service and the NSW Fire Brigades to discuss the issuing of fire permits and approvals in the Shire. Two primary issues were identified in the meeting. These were that all organisations consistently receive complaints in relation to fire permits and approvals and that there appears to be contradictions between legislation, polices and guidelines relating to fire permits and approvals. The purpose of this guide is to clearly define the responsibilities of organisations regarding the issuing of fire permits and approvals in all areas of the Shire. A permit is required if a fire is to be lighted in the open during the Bush Fire Danger Period. The Bush Fire Danger Period is usually from 1 October to 31 March, however this may vary due to local conditions. Permits are required at all times when fire is likely to endanger a building (NSW Rural Fire Service, 2003). Even if a permit has been issued, the lighting of fires is prohibited during a Total Fire Ban. Additionally, the permit will be suspended or cancelled on days of ‘High Fire Danger’ to ‘Extreme Fire Danger’ or when the NSW Environment Protection Authority declares a ‘No Burn Day’ (NSW Rural Fire Service, 2003). It can be determined whether a Total Fire Ban is in force by contacting the Rural Fire Service (Information Line) on 1800 654 443 or by accessing www.rfs.nsw.gov.au. It can be determined whether a No Burn Notice is in force by contacting the EPA (Pollution Line) on 131 555 or by accessing www.epa.nsw.gov.au/airqual/aqupd.asp (NSW Rural Fire Service, 2003). Permits are issued by the Commissioner of the Rural Fire Service or his/her delegate in rural fire districts or officers of the NSW Fire Brigades in fire districts. Fire permits are valid for up to 21 days (NSW Rural Fire Service, 2003). Bush fire hazard reduction is an essential (required by law) part of managing any property likely to be affected by dangerous bush fires. It can be carried out by hand clearing, mowing, slashing or by using fire. If a person wishes to burn off for genuine bush fire hazard reduction purposes and fuel material is in its natural state on the site, that person is exempt from environmental obligations under the Protection of the Environment Operations Act 1997. However, requirements of the NSW Fire Brigades or the NSW Rural Fire Service for hazard reduction works must be complied with (Wollongong City Council, 2002; NSW Rural Fire Service, 2003). The Bush Fire Hazard Reduction Certificate is the environmental approval for bush fire hazard reduction work only. This certificate is required if the bush fire hazard reduction work is to be undertaken in native vegetation, could threaten endangered species or result in air or water pollution or soil erosion (NSW Rural Fire Service, 2003). The NSW Rural Fire Service can issue a Bush Fire Hazard Reduction Certificate or provide advice on where to obtain another environmental approval. If a Bush Fire Hazard Reduction Certificate is issued, no other form of environmental approval is required (NSW Rural Fire Service, 2003). A Bush Fire Hazard Reduction Certificate is effective for a period of 12 months from the date of issue. If the proposed bush fire hazard reduction requires an environmental approval, a Bush Fire Hazard Reduction Certificate must be obtained prior to application being made for a fire permit. Under the Protection of the Environment Operations (Control of Burning) Regulation 2000, burning of vegetation in the Nambucca Shire is prohibited except with approval. Ø The impact on regional air quality and amenity. Ø The impact on local air quality and amenity. Ø The feasibility of re-use, recycling, or other alternative means of disposal. Ø Any opinions of the sector of the public likely to be affected by the proposed approval. Ø Any opinions of the EPA in relation to the proposed approval. It is often the case in the Shire that a lot is cleared for construction purposes, with the vegetation subsequently stockpiled on-site (Figure 1). If the intention is to dispose of this material through burning, an application to do so must be submitted to Council. It is possible that the application will be denied through Council carrying out its abovementioned legislative responsibilities. 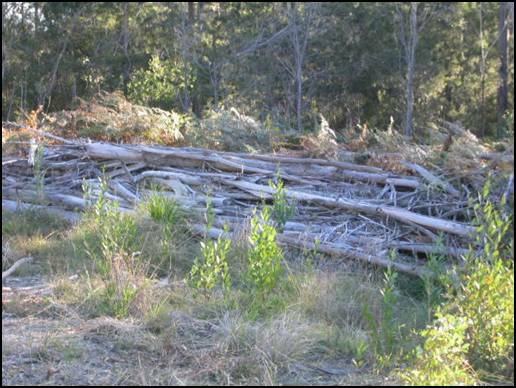 Figure 1: Cleared vegetation that has been stockpiled. Ø Cook or barbecue in the open or to light, maintain or use a fire for recreational purposes. Ø Burn vegetation, in the course of carrying on agricultural operations, on premises on which the vegetation grew. Ø Burn anything for the purposes of the giving of instruction in methods of fire fighting by a relevant officer. Ø Burn anything in an appropriate incinerator. Ø Burn domestic waste (other than vegetation) on residential premises on which the waste was generated if domestic waste management services are not available on those premises. § Carry out bush fire hazard reduction work under the Rural Fires Act 1997. § Destruct, by means of burning, of any prohibited plant or prohibited drug under the Drug Misuse and Trafficking Act 1985. § Destruct, by means of burning, of an animal that has died or is reasonably suspected to have died as the result of a disease proclaimed under relevant legislation. Ø Taking into account the potential for smoke impacting on any person due to wind direction and weather conditions. Ø Taking reasonable measures to ensure that the material being burnt is not wet. Ø Burning only material that is suitable for disposal by burning, having regard to possible effects on human health and the environment. A person must not burn tyres, coated wire, paint containers and residues, solvent containers and residues or timber treated with copper chromium arsenate (CCA) or pentachlorophenol (PCP) in the open or in an unlicensed incinerator. It is not an offence however, to burn a tyre for the purposes of the giving of instruction in methods of fire fighting by a relevant officer. Table 1 (below) summarises the types of approvals required in the Local Government Area for different burning activities and where they may be obtained. Table 1: Approvals required in the Nambucca Shire for different burning activities. Fire Permit in addition to any approval specified above. A Hazard Reduction Certificate or Control of Burning approval to be obtained prior to submitting an application of a Fire Permit. Note: Lighting of open fires during a Total Fire Ban is prohibited. A Fire Permit will be suspended or cancelled on days of ‘High Fire Danger’ or ‘Extreme Fire Danger’ or when the EPA declares a ‘No Burn Day’. Table adapted from NSW Rural Fire Service, 2003. It is reiterated that a person that burns anything in the open or in an incinerator must do so by such practicable means as are necessary to prevent or minimise air pollution (refer Page 4). Penalties exist under the Protection of the Environment Operations (Control of Burning) Regulation 2000 for non-compliance. To clearly set out the obligations of landowners and residents in respect to burning off in the Nambucca Shire Local Government Area, and an adjunct to Council’s ongoing commitment to a comprehensive and long-term plan for air quality management across the Shire. approval means an approval in force that may be granted so as to permit burning in circumstances where it would otherwise be prohibited under Clause 6E. domestic waste means waste (other than vegetation) that is of a kind and quantity ordinarily generated on domestic premises. domestic waste management services, as defined in the Local Government Act 1993, means services comprising the periodic collection of domestic waste from individual parcels of rateable land and services that are associated with those services. The Department of Environment and Climate Change (DECC) repealed the Protection of the Environment Operations (Control Of Burning) Regulation 2000 and incorporated its provisions as Part 2A of the Protection of the Environment (Clean Air) Regulation 2002 referred to from here on as; the Regulation. The Regulation is designed to prevent air pollution from air borne particulates and chemicals to eliminate localised nuisance caused by smoke and odour generated by inefficient backyard burning off. There has been an increase in the number of enquiries relating to burning by residents within the Nambucca Shire. The majority of enquiries have related to smoke production, odour and human health effects. Fires inappropriately lit or managed, can endanger and impact on lives, property and the environment. The purpose of this Policy is to clearly define the responsibilities of organisations regarding the issuing of fire permits and approvals in all areas of the Shire. This Policy sets out ways individuals can avoid damaging impacts by following basic procedures and knowing how to obtain the correct approvals, prior to burning. 1 Prohibition of burning certain items including tyres, coated wire, solvent containers & residues, paint containers & residues and treated timber – copper chromium arsenate (CCA) & pentachlorophenol (PCP); except where exempted in accordance with Clause 6D of the Regulations. c Burning only material that is suitable for disposal by burning, having regard to possible effects on human health and the environment. Burning of domestic waste is prohibited throughout the shire except where there is not a domestic waste collection service available. Council is listed under Schedule 8 Part 2 of the Regulation that deals with burning of vegetation. Council has applied the controls on burning vegetation only to the area within towns, villages and known urban and rural residential zonings. Any persons wishing to burn vegetation in an area identified in bold yellow on the maps, that form part of this policy, must submit a written application to Council. This policy constitutes an approval to burn under Clause 6G(2)(a) of the Regulation. Where a domestic garbage service is NOT provided, Council has delegated, to the Rural Fire Service (RFS), authority to issue approvals to burn domestic waste and vegetation. Burning of vegetation (subject to the general obligations) is permitted other than within the urban and rural residential areas (Bold yellow on maps). NOTE: Council, under legislation, may consider individual cases involving burning of dry vegetation within the controlled area. Council officers are required under the Regulation to assess each application presented and may issue a written approval if satisfied with it. Council must keep a copy of each approval and maintain a public register (see Section 5.8 of this Policy). c Destruction by means of burning of an animal that has died or suspected of having died of a disease proclaimed under the Stock Diseases Act 1923 or an exotic disease within the meaning of the exotic diseases of Animals Act 1991.
b Flaring of waste gasses. For details please contact Council. a There are provisions in the Act that enables Council’s authorised officers to require extinguishment of any fire, which the officer can confirm is causing a serious risk to the health of any person. A similar provision applies where it can be confirmed that a fire is not conducted in such a manner as to minimise air pollution. Inquires may be made to Council regarding any aspect of this point. b Shire residents are reminded that this policy does not relate to the safety aspects of burning off. Obligations under the Rural Fires Act 1997 require the seeking of permits during the bushfire danger period (Section 5.6 of this Policy). There are notifications required both to Council and to adjoining neighbours for the conducting of fires at any time of the year (Section 5.9 of this Policy). Council authorised officers and certain officers of other authorities, are empowered to serve Penalty Notices where it can be established there has been a breach of the Regulation. Penalties are set by the Protection of the environment (Penalty Notices) Regulation 1999. A permit is required if a fire is to be lit in the open during the Bushfire Danger Period. The Bushfire Danger Period is usually from 1 October to 31 March annually, however this may vary due to local conditions. Permits are required at all times when a fire is likely to endanger a building. Permits are issued during the Bushfire Danger Period by the Commissioner of the Rural Fire Service or his/her delegate in rural fire districts or officers of the NSW Fire Brigades in fire districts. Fire Permits are valid for up to 21 days. Even if a permit has been issued, the lighting of a fire during a Total Fire Ban is Prohibited. Additionally, the permit will be suspended or cancelled on days of ‘High Fire Danger’ to ‘Extreme Fire Danger’ or when DECC declares a ‘No Burn Day’. Determining weather a Total Fire Ban is in force can be done by phoning the Rural Fire Service (information line) 1800 654 443 or on the web at www.rfs.nsw.gov.au. To find out if a No Burn Notice is in effect call the Pollution Hotline on 131 555 or visit www.environment.nsw.gov.au/airqual/aqupd.asp. Bushfire Hazard Reduction is an essential (required by law) part of managing any property likely to be affected by dangerous bushfires. It can be carried out by hand clearing, mowing, slashing or by using fire. If a person wishes to burn off for genuine hazard reduction purposes and fuel material is in its natural state on the site, that person is exempt from environmental obligations under the Protection of the Environment Operations Act 1997. However, requirements of the NSW Fire Brigades or the Rural Fire Service for hazard reduction works must be complied with. § air or water pollution. A Bushfire Hazard Reduction Certificate is the Environmental Approval for hazard reduction work only. The NSW Rural Fire Service can issue a BHR Certificate or provide advice on where to obtain other environmental approvals. A BHR Certificate is effective for 12 months from the date of issue. If the proposed hazard reduction requires an environmental approval, a BHR Certificate must be obtained prior to application being made for a fire permit. The following table summarises the types of approvals required in Nambucca Shire Council area for different burning activities and where to obtain that permit. Lighting of fires is prohibited during a Total Fire Ban. A Fire Permit that has been issued by the NSW Rural Fire Service or NSW Fire Brigade will be suspended or cancelled on days of ‘High Fire Danger’ or ‘Extreme Fire Danger’ or when DECC declares a ‘No Burn Day’. Submission of an application to burn off, is to be directed to Council after careful consideration of the above table in Section 5.8 of this Policy. NOTE 2: In Residential Areas including Rural Residential Areas and areas shaded solid bold yellow on the maps, in section 4 of this Policy, an approval from Council is required all year prior to burning. In addition, a permit from the Rural Fire Service(RFS) or NSW Fire Brigade (NSWFB) is required during the Bushfire Danger Period prior to burning. The RFS and NSWFB will not issue a permit until Council has granted an approval. NOTE 3: In Non-residential Areas and all areas that are not delineated by a solid bold yellow marking on the maps in Section 4 of this policy, , an approval from Council is not required prior to burning. However a permit from the RFS/NSWFB is required during the Bushfire Danger Period prior to burning. c Other amenities in the immediate area, eg schools, playgrounds, nursing homes, hospitals and commercial areas. A Burning in Nambucca Shire application form must be filled out and paid for at the time of lodgement. Once the application is received by Council it will be assessed and if deemed possible, a Public Notice will be displayed in the local print media calling for submissions in relation to the proposed burn within 7 days (refer to example below). The cost of the public notice is included in the application fees. Submissions will close at 4:00 pm on Thursday, 30 June 2009. The Consultants, Integrated Site Design (ISD) will present a draft business plan relating to the Scotts Head Master Plan. 1 That Council note the presentation from the Department of Lands and Integrated Site Design of the draft business plan for the Scotts Head Master Plan. 2 That Council determine whether to proceed with the Scotts Head Master Plan based on the Business Plan workshopped by the Department of Lands and Integrated Site Design. The Department of Lands and the Consultants Integrated Site Design (ISD) will make a presentation relating to the Scotts Head Master Plan as exhibited. The presentation will address the income potential and expenditure of each area. Council will be able to see the relevance to the inclusion of Adin Street Oval to the project. I attended another Project Facilitators Meeting (PFT) on Tuesday 29 September 2009. Subject to the adopted scenario. The draft business plans will address this aspect. The draft business plan will address this aspect. The two new amenity buildings at Coronation Park are nearing completion. An inspection of the buildings will be held for Council representatives. In attendance will be Mr Andrew Carniato of A & A Landmark Constructions Pty Ltd, the Contractor and Council’s Engineering Designer, Stephen Fowler who has managed the project. A & A Landmark Constructions Pty Ltd were awarded the tender to construct two amenity buildings on Coronation Park at Nambucca Heads. The project is well advanced and the opportunity is being taken to inspect progress. There are plus and minus costs involved with extra costs in the range of $5,000 to $10,000. Included in the budget is $32,000 to renovate the existing Soccer building. At this stage the exterior will be painted to match the new buildings out of this allocation. This still leaves a contingency of nearly $20,000 to address the old Rugby League building. This will be the subject of a separate report. Coronation Park is a major sports ground for Nambucca Heads. The new buildings will provide the opportunity for greater income generation through clinics with NRL clubs. The sporting clubs are yet to experience the new buildings but they should be satisfied with the facilities. The final use or demolition of the old Rugby League building is yet to be decided. The allocated budget meets the construction and renovation costs. Initial maintenance costs will be low. The hot weather is generating requests for bitumen strips in front of houses to be provided by Council to control dust. In the past Council did provide funds for such work. A register of applicants has been maintained should Council be in a position to re-introduce the program. 1 That Council not provide funding in the 2009/2010 budget for the “Bitumen Sealing in Front of House” program. 2 That Council permit short sections of bitumen sealing for dust suppression if the landowner meets 100% of the cost. Council has in past years allocated around $30,000 to provide a 100 metre strip in front of around 3 rural houses that are subject to a high dust nuisance. The program still exists but is “unfunded” and has been since 2005. The matter is being raised now because the hot weather is generating dust and requests are being made for sealing in front of houses. Council hold some 35 applications with each applicant required to submit details on the distance from the house to the road, years of residence, age and health issues to enable justifiable selections to be made. Should Council determine to provide a budget then each application will need ranking to make the successful selections as this will be contentious. The sealing in front of rural houses has not been a priority in recent years with the maintenance of existing bitumen surfaces the main need. The sections are short (100 m) and often in isolated areas resulting in little maintenance and a gradual deterioration of standard. The cost of a 100 m section in 2009 would be $20,000 - $25,000. Adding two sites will require a budget of $40,000 to $50,000. There will be instances when the landowner is willing to contribute to the cost because of health issues. Even though these short sections of bitumen are a maintenance issue such requests could be granted if the applicant meets the full cost. Dust is an issue in dry periods for roadside vegetation on all general rural roads. Households next to a gravel road will suffer significant dust problems at times. This could impact on health, cleanliness and water supply. The cost of $20,000 to $25,000 (100 m) for each residence is not an economic proportion if considered only as a road maintenance. Residents with health issues may be unable to remain at the property. No budget provided in 2009/2010. Reinstating a $40,000 to $50,000 budget will address the problem of two households. At this level of expenditure it will take 17 years to address the current list. Council has insufficient funds to adequately maintain its existing sealed roads so extending the length of seal in often isolated locations would be poor financial management. Please complete application in black pen. Are you the owner of the house? Number of years resident at this house? The property at 69 McHughes Creek Road South Arm NSW 2449, previously owned by Mr and Mrs Waddell is now owned by Warnley Pty Ltd and a new application for sealing has been put in by Mr G and Mrs I Creighton (Property in the name of Warnley Pty Ltd). Council has been a participant in the Cities for Climate Change Protection (CCP) Program since November 2007. Input of Council data had commenced however funding for the website was discontinued on the 30 June 2009. Council was provided with a spreadsheet of raw data input and this has now been developed internally to provide a history of Council’s energy usage and emissions. It should be noted that Council has not subscribed to the CCP Partners Program. The results are provided in the summary table circularised. The data was used to calculate a forecast year and this is the basis for the achievement of milestone 1 (a Checklist is attached). All available data was collected for Council buildings, water and sewerage supply, street lighting and fleet operations from 2006 to date. The data for 2006 was considered to be unreliable therefore a base year of 2007 was adopted (see table circularised). The data supplied by CCP for community analysis had adopted a base year of 2006. This data was adjusted by a population growth factor of 0.5% to bring it in line with the adopted base year of 2007. It should be noted that accurate forecasting is difficult due to random fluctuations in usage from one year to another. This is particularly significant where usage has reduced between the base year and interim year. It has been assumed that if the interim year value is less then the base year value then the forecast is based on a 0.5% increase per annum from the base year figure. Data has also been calculated for reduction targets of 5% and 10% respectively. These are provided for information and as a guide for Council if proceeding to Milestone 2. Guidelines for Milestone 2 are attached. Australia’s National Emissions Target Fact Sheet is also attached. Could result in lower operational costs due to reduced energy usage. This could mitigate future carbon offset costs. There is no direct impact on budgets as a result of this report. The adoption of carbon reduction strategies could reduce or at least contain operating costs in the event of any emissions trading scheme.